Oh Jirachi, how I do love thee. 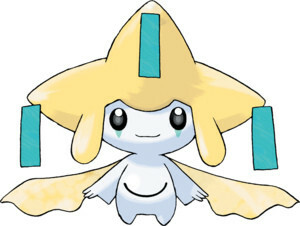 Jirachi is the Wish pokémon, with a height of merely 1′, and a great tendency to nap. Jirachi is a Steel and Psychic-type pokémon, with weaknesses to Ghost-types, Dark-types, Fire-types, and Ground-types, and a strength against Fighting-types and Poison-types. 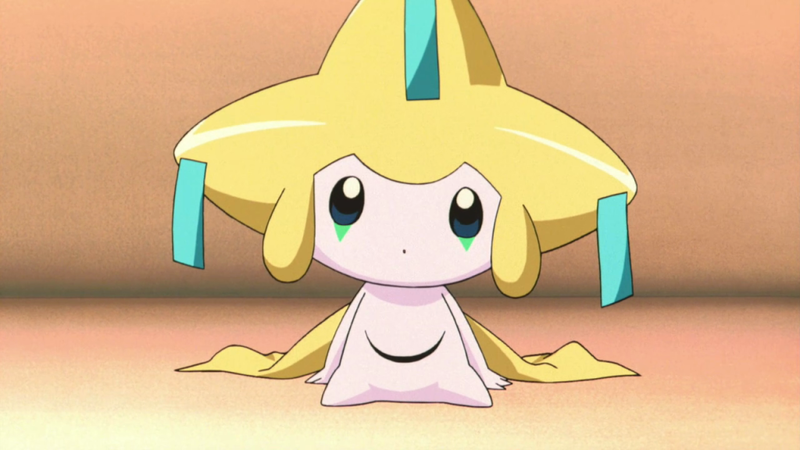 Jirachi has the common ability Serene Grace, and because it has yet to be reintroduced in generation six, when hidden abilities became available, it has no hidden ability of its own. Jirachi is steeped in lore and hard to come by, both in legend and in game. 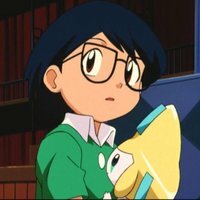 Jirachi holds a special place in my heart and this blog, most specifically in the form of the title Favorite Pokémon I Don’t Have. Jirachi has quite the fan base, which is understandable. It’s adorable, huggable, and lovable. Jirachi’s gotten his own movie, been in an episode of the Black2 and White2 arc of the anime, he’s been the reason for a part of the adventure in the latest installments of the Poké manga, not to mention all the girls grabbing for his attention. I would venture to say that his popularity really began when Nintendo released the movie: Jirachi: Wish Maker. Before we get into the movie’s details, a little backstory. Jirachi is a very mysterious pokémon who only stays awake for one year every century. During this period, any who asks Jirachi to grant a sincere wish will find their wish granted, but only if Jirachi wills it. Each wish is written on one of the notes on Jirachi’s head, which means that Jirachi can only grant three wishes every century; so be careful what you wish for! Of course, not everyone is as careful as they should be, which leads me to the plot of Jirachi: Wish Maker. In Jirachi: Wish Maker, Ash, Brock, May, and Max (The four main characters of the Hoenn branch of the Pokémon anime) have journeyed to a great desert to participate in a big carnival and watch the Millenium Comet streak across the sky. While at the carnival, our heroes watch and even accidentally participate in a magic show put on by the Great Butler, and his assistant Diane. After thwarting Team Rocket’s plans to capture Pikachu, Max bonds with a large gemstone that is believed to be the dormant form of Jirachi. When Jirachi awakes, a sudden and surprising evil reveals its plans for Jirachi, which our heroes soon decide to fight in order to protect him. And the chaos only ensues from there! Can our heroes manage to prevail? I don’t know, not my problem. Actually, I do know, and I loved the movie. However, to preserve it for the rest of you, I’ll refrain from giving away further plot details. To say the least, it was a pretty great movie. 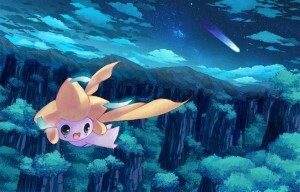 But, as always, story is not the only reason I love Jirachi, he’s pretty boss power-wise. With every stat having a base of 100 and only climbing from there, combined with a wide movepool, there isn’t a lot this guy can’t handle. Of course, not that I would know; after all I don’t actually have one. I have a few pretty serious goals to fulfill in my poké-venture. One of them, is to own a Shiny female Eevee (or male, really just a Shiny Eevee in general), another would be to have a legitimate (legitimate, Max) Jirachi all my own. 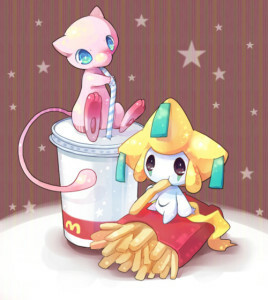 Of course, there is one more, key fact of Jirachi that leads to one of my biggest fan wishes. The slit you saw on Jirachi’s belly on the top of the page is actually the lid of his third eye. Jirachi always opens his third when granting a wish, because the third eye is part of his true power. The third eye, being the key to Jirachi’s power, would then be a perfect thing to piece around either a Mega Evolution, or possibly a Primal Reversion. Jirachi would be re-released, his strength would be increased even more than it is now, and it would look totally boss. Then again, I can’t do anything on my own about this. If you guys want to see Mega Jirachi or Primal Jirachi, let me know! Otherwise, enjoy Pokémonth everyone, I’ll see you later! Hey! It WAS legitimate! It’s just that the save file was removed, and I wanted him back. That’s all.